Photos by Tom Rivers: Kent Morgan, owner of Let It Ride Charters in Carlton, holds the grand prize fish, a 29-pound, 14-ounce salmon caught by his customer, Joseph Miller of Harrisburg, Pa. The big fish won the $4,000 grand prize. 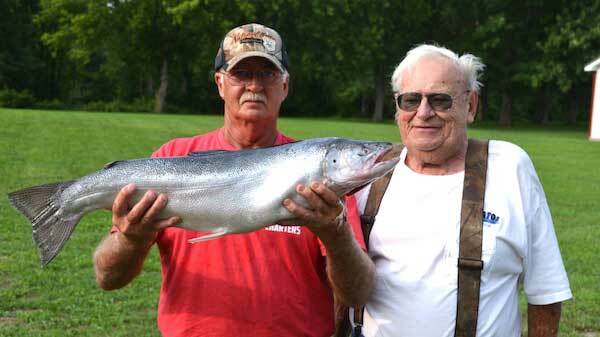 CARLTON – The Orleans County Fishing Derby concluded today after 16 days with a nearly 30-pound salmon taking the top prize, $4,000. The derby has been an annual event for about 35 years. There were almost 400 participants in the competition, which is sponsored by the Albion Rotary Club. 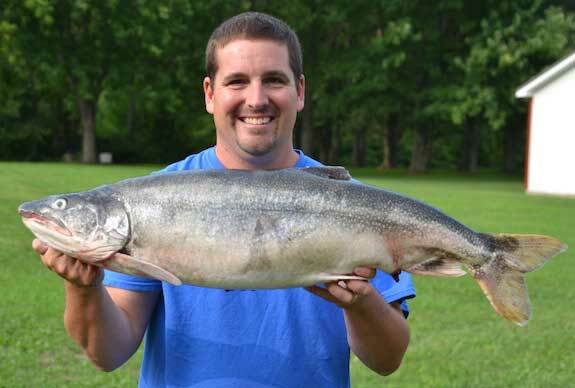 The grand prize fish – 29 pounds, 14 ounces – was caught by Joseph Miller of Harrisburg, Pa. He was on a charter boat owned by Kent Morgan, who has been a local charter captain for 18 years. 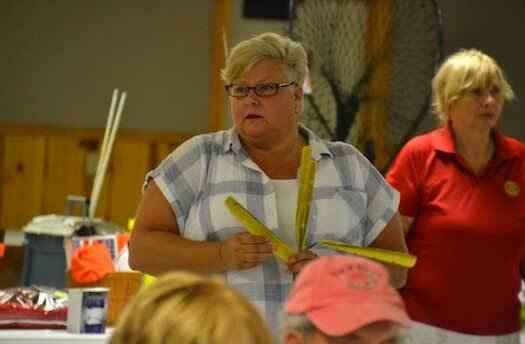 Besides $4,000 for the biggest fish, the four division leaders – salmon, rainbow trout/steelhead, lake trout and brown trout – each get $500, followed by $300 for second, $200 for third, $100 for fourth and $50 for fifth. 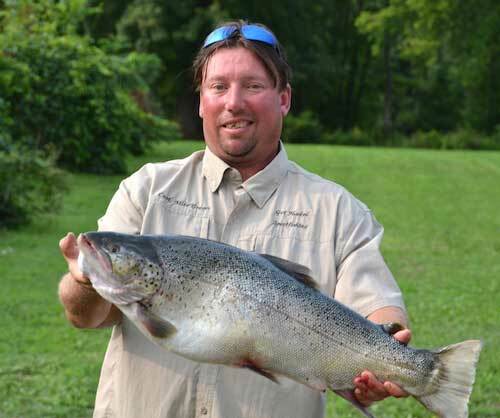 • Salmon – 26 pounds, 14 ounces by Mike Schaeffer of Silgo, Pa.
• Rainbow/steelhead – 12 pounds, 2 ounces by Glenn Weber of Harrisburg, Pa.
Brian Gambell of Hilton holds the first place lake trout at 17 pounds, 12 ounces. Michael Grager of Lyndonville holds the first place brown trout at 14 pounds, 13 ounces. Grager is the charter boat captain of “Get Hooked” based at Point Breeze. He noticed the leaderboard didn’t have many brown trout more than midway through he derby so he made a concerted effort to catch them. 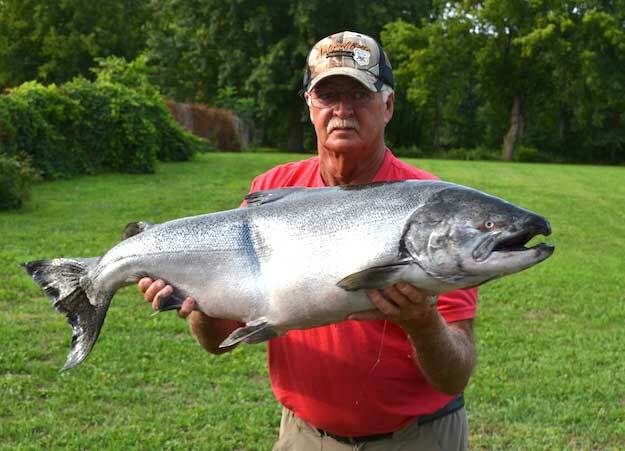 In the beginning of the derby he thinks most anglers are focused on catching big salmon. He used a spoon in shallow water just east of the Point to catch the first place brown trout. 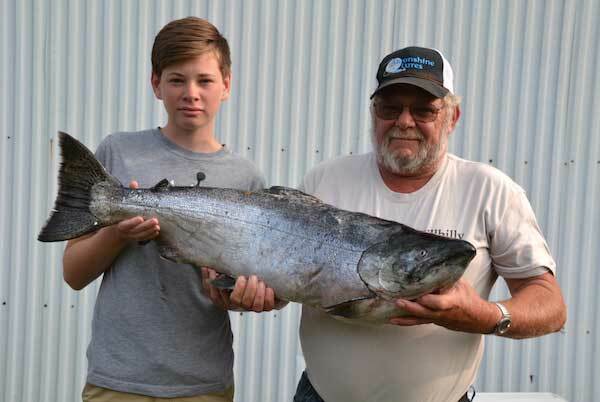 Dane Ballard, 14, of Aberdeen Proving Grounds in Maryland holds a 26-pound, 3-ounce salmon he caught with his grandfather, Denny Jackson of Ogdensburg, Pa. The fish was the second place salmon in the derby. The first place winner for steelhead also was on Morgan’s boat, Let It Ride Charters. Kent Morgan holds the fish with his first mate, Jack Rossman. Glenn Weber of Harrisburg, Pa., caught the 12-pound, 2-ounce fish which won first place. 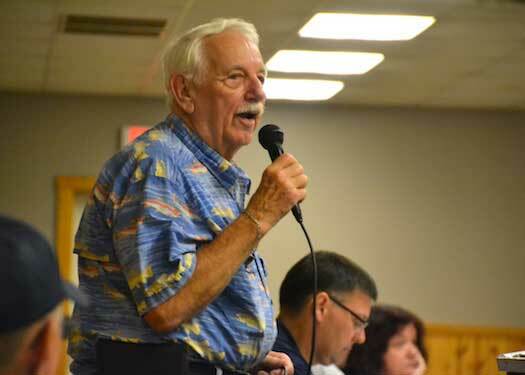 Mike Waterhouse, retired sports fishing promotion coordinator for Orleans County, served as the emcee of the awards program at the Carlton Recreation Hall. Becky Karls, left, sold raffle tickets and Marlee Diehl, back right, handed out prizes. About 75 people attended the awards program. 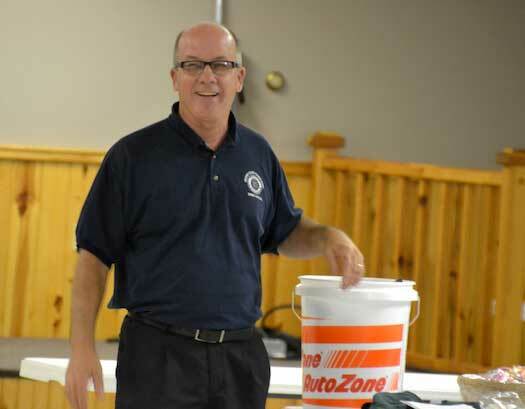 Bill Downey, chairman of the derby, also distributed some of the prizes at the awards event. Many local businesses donated for the event.